The 300th boarded a ship on December 3, 1943 at Pier #92 in New York that they later learned was the Queen Mary bound for Europe. Captain Bisset was the Ship Commander with a British crew of 1,087 and 11,907 troops aboard. Hitler had offered a one million Reichs-Mark reward to the U-Boat commander that sank the Queen Mary-a reward that was never collected. A coin toss aboard the Queen Mary between Major John Burfening, commanding officer of the 207th Engineers, and Major Riel Crandall, commanding officer of the 300th Engineers decided who would have MP or KP duty. 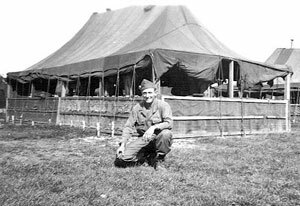 Crandall won and chose MP duty which mostly involved keeping the troops moving toward the chow line and then returning to their bunks or sleeping location. The Queen Mary zigzagged her way across the Atlantic Ocean changing course every seven miles. She averaged 26.98 knots and covered the 3,540 mile trip in five and a half days arriving on December 9, 1943 in Gourock, Scotland near Glasgow. The 300th boarded troop trains a day later for an all night trip to Reading, England and finally moved by truck convoy to Devizes, England, a town about 50 miles southwest of London, arriving on December 12. 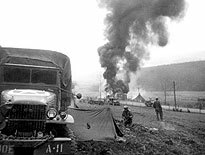 We got on a train at Camp White and when the train pulled out I told the men we were headed for Camp Shanks, New York and probably that meant we would be going to North Africa or Europe. We got to Camp Shanks and all of you got promoted from engineers to MP's and we got on the Queen Mary. We were to be the MP's for the trip. We got to Scotland and after everyone got off the ship, we stayed on another day until a bunch of British pilots came on board and took over our duties. They were going to be taken to the U.S. for special pilot training. Our unit was selected to serve as Military Police for the voyage. The British food was terrible, lots of kidney stew and a very bitter orange marmalade. We were given only two meals a day. There were over 11,000 troops on the ship and it took all day to serve two meals to that many troops. The ship went unescorted and five days and nights later we dropped anchor just off the coast of Gourock, Scotland. We went ashore on "tenders" and boarded a train. Some 24 hours later, we arrived at Devizes, England, not far from London. We were there for only a short period of time and spent Christmas there, however I think that most of us did not even realize that it was Christmas. The 300th were attached to the 1110th Engineer Combat Group while in England under the command of Lt. Col. Daniel Spengler, headquartered at Sonning, Berkshire, England. 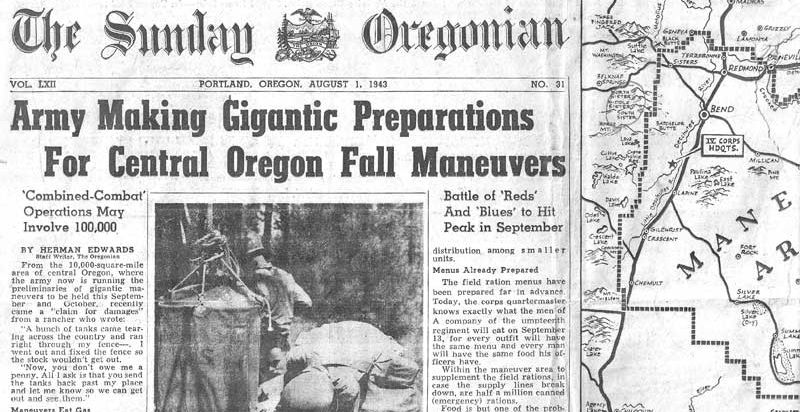 The 1110th, including the 300th, had specialized training in building Treadway and Bailey bridges and erection and removal of bridges in all kinds of weather conditions during the day and at night. They also had training in road construction and maintenance, use and maintenance of power equipment and in laying and removing minefields. The 300th moved to various locations in England constructing a camp at Bristol, a gasoline station at Westbury and a railhead at Sparkford. They also built and maintained roads for a station hospital at Haydens Park and found permanent "quarters" in Swindon, England. We moved out to some real delightful, plush surroundings - some nice tents in Swindon, England, to enjoy the rest of the English winter. We were training at the Thames River. We built so many bridges over the Thames to where I don't know how much steel is still on the bottom of the river, particularly those pins from the Treadways that we dropped. We really got into this bridge building training for the invasion. I remember competitions between company commanders on how long it took to get a bridge built and take it back down. There were some sizable bets. I wasn't supposed to know about it but you would be amazed what you learn if you just listen. You would find out things that it might be better if you didn't know. The "detective" work of Cpl. Don Richter produced two telephone numbers for the surviving spouse of Lt. Henry Webendorfer, commander of Co. B. Don made telephone contact with Lillian in Wisconsin and talked with her at length. He later got a call from Lt. Webendorfer's son, Jim. More recently, Jim's wife Gretchen has been in touch with Jan and Brad by e-mail. They plan to scan materials that Lillian Webendorfer kept from Lt. Webendorfer's time in WWII. Another detective effort by Don Richter also has already had positive results. Don, along with Brad and Jan, have attempted without success to contact the wife of Col. Riel Crandall, Battalion Commander. In January, Don wrote a letter to Bea who showed it to her daughter, Adrienne, who then contacted Don by e-mail. She told Don that Bea is in good health and still living in their homestead in Cromwell, Connecticut. Adrienne and her husband, Paul, live only a couple of hours from Jan and Brad and have shown a great deal of interest in contributing information for the 300th web site with material Bea still had at her home. Thank you, Don, for developing these most valuable contacts. The Dallas Reunion in June, 2008, organized by Sgt. Randy Hanes, and the Tyler Reunion in October, organized by Sgt. Chuck Bice and Tech 5 William Lakey, were very well attended. There were updates on the 300th web site, interviews, photos scanned for the site and lots of sharing of war stories. Mike Kennedy whose father, Cpl. Rayburn Kennedy, of Co. B and wounded in the sinking of LST 523, attended the reunions for the first time. He volunteered to visit Tech 5 Roy Bridges and Tech 5 Fuqua Boyd taking for them materials distributed at the Dallas reunion. Gary Brown, son of Pfc. Clovis Brown of Co. C, attended his first reunion. Barbara Sprick, daughter of Cpl. Jake Phillips, and her husband, Ron, attended the Tyler Reunion and Pvt. Harold Meyer attended the Dallas Reunion for the first time. In May of last year, just before the Dallas Reunion, Sgt. Jack Burke was diagnosed with lung cancer. Although he wasn't quite himself and had just started treatment, he did attend the reunion with his wife, Lavonia, and daughter Debbie. Debbie reports that Jack's treatment was quite successful and he is doing quite well considering what he has been through. Those who know Jack know that he is a fighter. Our prayers are with him and his family. See you, Jack, at the next reunion. It has been reported that two of the 300th men have passed: Tech 4 Robert W. Krug, Co. A and Tech 4 Henry T. Uhr, Co. A. In the next issue we will summarize stories in the Albany (Georgia) Herald featuring Sgt. Leonard Burke. If you have not checked out the 300th web site recently you may be surprised. There have been changes, additions and corrections. At the reunions in Dallas and Tyler in 2008, the men and their families provided more recorded interviews, photographs, identification of photographs and clarification of information. Many details have been found in the 6000 pages of Morning Reports, After Action Reports and military photographs we have obtained from Army Archives in Maryland and St. Louis. We have made contact with valuable resources outside of the 300th and they have permitted us to use their research, writing and even illustrations all now included in the site. Chapters in the History have been reorganized. Recollections have been added to the History in the appropriate sections. The History is now more than half in the words of the men of the 300th. The story of LST 523 has been expanded with the contributions of eye witnesses from the Navy and Coast Guard. Many photographs from the IMAGE GALLERY have been added to the History in appropriate locations. Click on the photograph to enlarge it. 47 audio interviews with the men have been added to the Men of the 300th and also added to the History. Click on a gray box to hear the audio. As always, we invite your continued contributions to the site of information, corrections and any comments you may have.